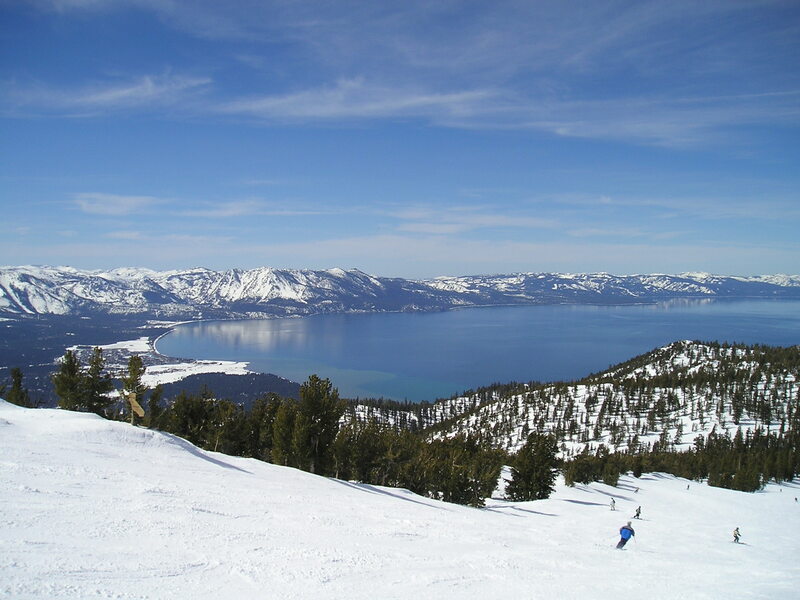 If you’ve had the doubtful pleasure of reading my recent post about Heavenly ski resort (www.tonyquarrington.wordpress.com/2012/01/20/heavenly-thoughts-returning/), you ‘ll be aware of my love of skiing, particularly on the snow rich slopes of Lake Tahoe. But had circumstances been different a quarter of a century before on my first winter vacation, that may have been a pleasure forever denied me. Encouraged by another couple, already experienced skiers, my girlfriend and I agreed to accompany them on a two week holiday to Austria in late February 1987. But before that, we had to locate our ski legs and take the first tentative, or in my case, petrified, steps on snow, or rather, artificial Dendix mesh. The ordeal began with a course of evening lessons at the Crystal Palace Sports Centre dry ski slope in south London. Sadly, I recollect little of the first lesson other than it took me more than half of it before I was able to a) wedge my feet into the concrete boots, b) stand up and c) begin to tramp around in them in a manner reminiscent of Boris Karloff in the early Frankenstein movies. The “slope”, if it could be dignified with such a noble word, was a terrifying 60 metres long and of a gradient that would barely have qualified it to be called a green run i.e. virtually flat, in any self-respecting European resort. But, for me, the distance from top to bottom resembled a pit of writhing, seething snakes. Half way down, in the middle, stood a menacing, 8 foot high tree that called to me, like the Sirens luring sailors to shipwreck in Greek mythology, every time, and there weren’t many, I had managed to plod back to the top to make my next descent. Either side of this monster were run-outs to the bottom. It was not until the third lesson that I succeeded in routinely reaching the end without having had an intimate encounter with that tree along the way. A couple of long, agonising months later the fateful hour arrived when we set foot – blessedly freed, for now, from those concrete blocks – on a flight to Munich, praying that the worst of the winter conditions were over and that we would catch some spring sunshine. Our destination was Auffach – notoriously difficult to pronounce after a couple of glasses of schnapps or jagertee (a potent mix of overproof rum and black tea) – in the Wildschonaü region of Austria, an area allegedly ideal for beginners. My girlfriend and I spent the first week in ski school whilst our friends enjoyed themselves. She was marginally, well much, better than me in the initial test, which amounted to nothing more than being able to stand up in the skis for more than 3 seconds, and was, consequently, placed in a higher standard class. I was consigned to the lowest group which comprised one Austrian girl and half a dozen boisterous (is there any other type?) Dutch men. The instructor, who at least had the decency to be gorgeous, even in a pink Michelin (UK) or Stay Puft (US) Man outfit, spoke Dutch fluently and used it as the default language for the week. Unfortunately, the only Dutch I knew, other than the names of the national football team that came so close to winning both the 1974 and 1978 World Cups, was of the double variety, though I do profess to being quite fluent in that. At least I had found a ready made excuse for my ineptitude. And that spring sunshine? Forgeddaboutit. Snowfall had been a stranger to the area since Christmas and it was conspicuous by its continued absence during our stay. Whilst the weather was generally bright it remained cold, rendering the surface thin and icy. My “progress” was tortuously slow. When I wasn’t trying to step off the precarious button lifts prematurely, obliging me to climb the remainder, inevitably slipping back with every other step, I was sliding down an icy incline in a permanent and deeply uncomfortable “snowplough”. I did, however, become highly proficient at trudging down the side of the run with a ski tucked under each arm, having surrendered any belief in my capacity to achieve the same result with them strapped to my boots. My girlfriend’s experience was equally disappointing and we agreed to forego the final day’s test run, and the life-changing opportunity to dribble down the hill in front of the entire ski school and any other sadists residing in the village, in the forlorn hope of earning a certificate (that was probably written in Dutch anyway). Exhausted from the miles, or rather metres, we had carved up in the previous 5 days, we decided to take a coach trip to Salzburg, city of Mozart, chocolate and The Sound of Music. An otherwise enjoyable day was marred by the news of the capsizing of the Herald of Free Enterprise ferry shortly after leaving the Belgian port of Zeebrugge en route to Dover, resulting in 193 deaths. Skiing seemed even less important on that day. I was prepared to come home at that point. However, we had paid for a second week, and there was a limit to the number of sleigh rides, bowling alleys and “authentic” Tyrolean evenings a man with his pride still narrowly intact could take, so I resolved to give skiing another chance. And it proved an altogether more enjoyable experience. Our friends were very patient and supportive, escorting us around the whole mountain (much of which we had only dreamed of seeing before), and providing us with one to one tuition – in English! Whilst conditions underfoot were little better, it was much more fun, and we improved accordingly – though my propensity for leaping off button lifts before reaching the top continued well into my third Alpine season. By the end of that second week, we were hooked and did not want to leave! Had the vacation only been for a week we may never have skiied again – and our subsequent holidays – and life – may have taken a completely different course. Having now posted the 16th article in the series, I think it is time to review the role of the “Great San Franciscan Characters” in my overall writing strategy. In my penultimate post of the last year (www.tonyquarrington.wordpress.com/2011/12/30/99-not-out) I stated that not only would I be reinforcing the San Francisco theme of the blog, but also “working on more substantial, long term projects”. One of those projects relates to this series. It had always been my intention that the material it contains might ultimately, with a fair wind, develop into a firm book proposal. Now if I am to make that a reality, and preserve the integrity of the subject matter, I will have to curtail publication of any more “chapters”, or else the book will already be in the public domain and available for free! Moreover, having read through a number of the preceding articles, I feel there is a clear need for significant revision, both to improve the quality of the individual articles and to ensure a coherent style and approach to the whole. So apologies for anyone who was actually enjoying the series. I hope I can replace it on the blog with (equally) interesting and entertaining pieces. Now Lillie Hitchcock Coit and Joe Montana are calling. Firstly, if you have landed on this site expecting subject matter a tad more racy or devotional than skiing, please leave now! After spending our formative skiing years in Europe, we decided in 1999 to try America for our winter vacation. 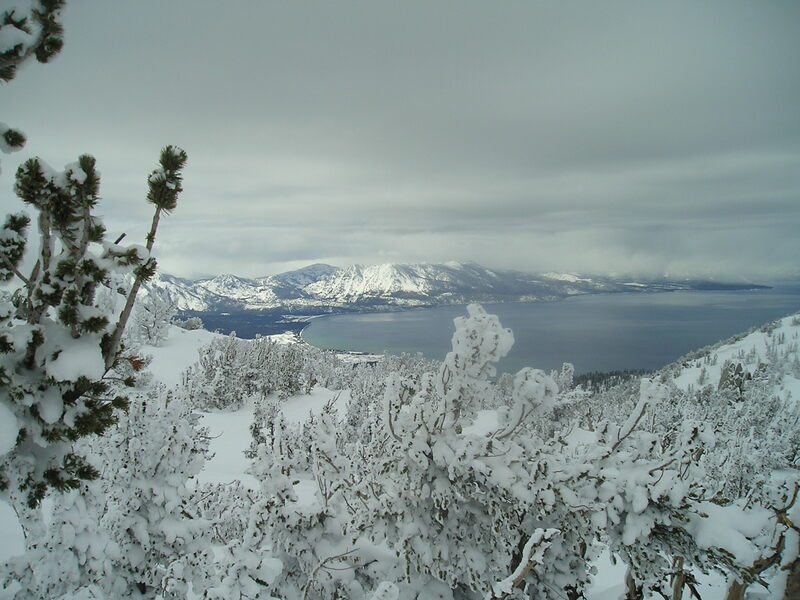 Lake Tahoe caught our imagination, not only because of its innate beauty and impressive snowfall record, but because it could comfortably be combined with a trip to San Francisco (and other parts of both California and Nevada). We fell in love with Heavenly and the unique California / Nevada Stateline atmosphere instantly, and despite acknowledging that we should expand our skiing experience to the Rockies or Canada, we have remained loyal to it ever since. We were even on the verge one year of booking Whistler or Banff and spending our “city time” in Vancouver, but when push came to shove, we hadn’t the heart to abandon Heavenly. Nor, in the face of numerous recommendations from people on chairlifts, in restaurants and on the street, have we skiied a single day in any of the other Tahoe resorts. Lame excuse though it may seem, we have, in a sense, not wanted to “waste” one of our precious skiing days at Northstar, Squaw Valley or Sierra-at-Tahoe. And where would we get a better breakfast than at the Driftwood Cafe in the village centre, or seafood dinner at the Riva Grill by the south shore of the lake? After our initial vacation we returned in 2002, followed by further trips in ’04, ’06, ’08 and ’10. 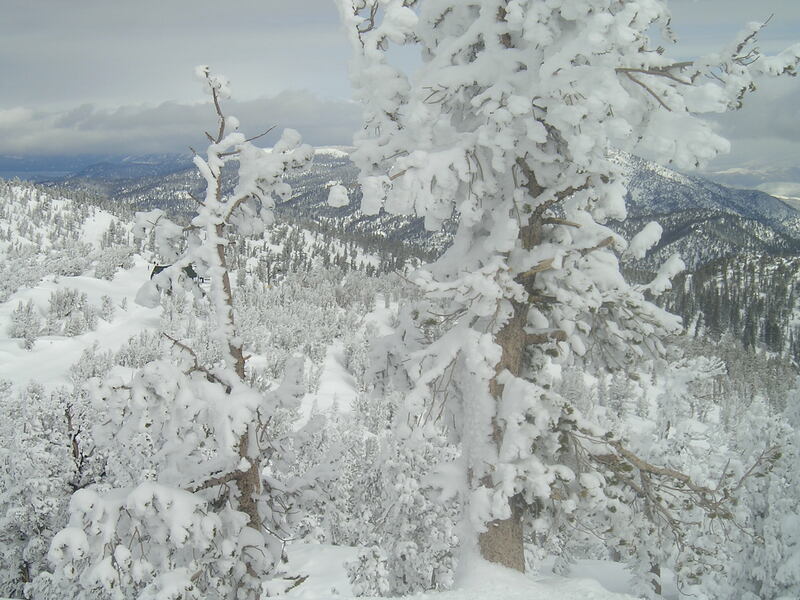 With a mountain that rises to over 10,000 feet and the largest snowmaking and grooming operation on Lake Tahoe if Mother Nature should fail to deliver, snow conditions have always been excellent. The weather during our stays has, however, been less predictable (for example, warm sunshine in ’04 and incessant snowfall in ’06, including 4 feet the night before we were heading for Vegas). The biennial strategy collapsed last year when we went again just 12 months after our last trip. This appeared at first to be a smart move as a record season was already in full swing when we arrived in early March. Now, we confess to being fair weather skiers, always going relatively late in the season, initially in late February, more latterly in mid March (and now April!). The theory is that there will not only have been substantial accumulations of snow already, but that the weather will have warmed up. Spring in San Francisco can be very pleasant too. So we scanned the web cams and drooled over the daily Another Heavenly Morning broadcast on the internet, watching the snowfall count escalating. Surely, this will have abated and Spring will have arrived with a swagger by the time we pitched up in the resort, allowing us to enjoy several days cruising on a deep snow base in balmy, sun-soaked weather? The year did, indeed, turn out to be a record one with a total 0f 529 inches snowfall (the average is anywhere between 300 and 500). But, after such a disappointing experience, we vowed that we would now leave it a couple of years before returning to Heavenly, perhaps even going back in the interim to getting our skiing fix in Europe again. But here we are in mid January and the itch needs scratching again (problematic when you are plodding around with several layers of clothing on, including an esapecially fetching pair of tights). The lure of both Heavenly and San Francisco has become too much, causing us to alter our vacation plans for the year. The four weeks travelling around the canyons and National Parks of the West to celebrate my 60th birthday later in the year has now contracted to two. We are undaunted by the uncharacteristically puny snowfall so far this year. Although the resort has been open every day since November 18th, the total snow for the season has only reached 13 inches (lower slopes) to 22 inches (upper elevations), and the base depth is just 18 to 24 inches. Only 215 acres out of a total of 4800, and 27 of the 97 runs (trails), are currently open. Limited terrain aside, the resort has still managed to provide high quality, if limited, snow in fine weather, with the army of “midnight riders” (groomers) putting in more than 1,200 snowmaking hours. And we have faith that the storms will come. In fact, as I pen this article, 3-6 feet is being forecast for the next week. It can snow now until early April as far as we are concerned. But please, let’s have a few days sunshine after that! “But soft, what light through yonder window breaks? It is the east and Juliet is the sun”. Even those with the most basic knowledge of, or interest in, Shakespeare, will be familiar with these words from Romeo and Juliet. Of course, they are uttered by Romeo in the famous balcony scene in Act 2. However, the scene before us is no Royal Shakespeare Company production in Stratford-upon-Avon but a gambling palace turned melodeon or music hall called the Bella Union, located at Washington and Kearney Streets in late nineteenth century San Francisco. And our “star-cross’d” lovers are not Laurence Olivier and Vivien Leigh, or even Leonard Whiting and Olivia Hussey, but a baseball bat wielding wild man and a 20 stone woman of whom it could not have been said for at least 30 years that she was “not yet fourteen”. The incongruity does not end there – because of her bulk she cannot be trusted not to demolish the balcony the moment that she steps on to it, so she is placed centre stage whilst Romeo growls his immortal words from the balcony instead. Romeo is played by Oofty Goofty, whom we have met already in this series (www.tonyquarrington.wordpress.com/2011/05/17/great-san-franciscan-characters-12-oofty-goofty) And his “all-seeing sun” was portrayed by Big Bertha, a wealthy woman with a dubious past. Their performances are the talk of the town, although Oofty’s violent displays leave Bertha “covered with bruises from head to toe” every night, leading to her vowing never to play the part again. Big Bertha, who is described by Herbert Asbury in his splendid The Barbary Coast as a “sprightly lass of 280 pounds”, had first appeared in the city in the mid 1880s claiming to be a wealthy Jewish widow in search of a man to help protect her fortune. In order to test any suitor’s value and good faith, she required him to hand over to her a sum of money that she would then double and risk on an unnamed investment. This worked so successfully that she “collected several thousand dollars from a score of lovelorn males, not a penny of which was ever seen again by its rightful owner”. Although she was eventually arrested for a succession of such scams, none of her victims had the courage to charge her for fear of public humiliation. She was released on nominal bail and the case against her dropped. She now decided to turn her attentions to a stage career, approaching Ned Foster and Jach Hallinan, managers of the Bella Union and Cremorne melodeons respectively. Recognising her potential they hired her immediately under joint management and put her on display in an empty storefront on Market Street. Dubbed the “Queen of the Confidence Women”, for ten cents she would, at regular intervals, rise from her reinforced chair and recount the list of dreadful crimes that she had committed in San Francisco and other cities, “embellishing her account with many vivid details”. She would then regale the assembled throng with horribly off key renditions of the only two songs she ever knew: A Flower from my Angel Mother’s Grave” and The Cabin Where the Old Folks Died. This proved so popular that, after a brief engagement at Bottle Koenig’s, where her erstwhile Romeo had also performed briefly, her act transferred to the Bella Union stage and converted into what became an equally celebrated song and dance revue in which she sang “sentimental ballads in a squeaky voice”. Aside from the Romeo and Juliet farce, Bertha was involved in one other crazy theatrical moment. She was cast in Byron’s Malzeppa as the eponymous hero strapped to a horse or, in her case, donkey as punishment for having an affair with a young countess. Her entrance always drew ecstatic applause, but one evening it all went horribly wrong. Wilting under the nightly strain of carrying Bertha, the donkey lost its footing and crashed into the orchestra pit, taking the massively proportioned Bertha with it. The musicians’ reaction has not been preserved for posterity but it is not unreasonable to speculate that their language was not equally as colourful as that bellowing from the lips of the hero / heroine’s. Neither can I report whether the hapless donkey sustained any lasting injury. But it did herald the end of Bertha’s bizarre acting career, who confined herself to singing and, on occasions, dancing. This proved more successful, culminating in her wrestling ownership and management of the Bella Union in 1895. However, restrictions placed on the sale of liquor three years previously eventually forced her to sell up and leave. And that is the last we hear of her. “So please you, let me now be left alone”. Finally I Get It: Go Niners! I have never understood, or cared to understand, American football. That is until last night. Purely because of our affinity with the city of San Francisco, my wife and I had considered celebrating our first wedding anniversary at Wembley Stadium in October 2010 when the 49ers came to town with the Denver Broncos – until we saw the exorbitant prices. We went to Dublin for the weekend instead. Last season, as dozens of others before, had completely passed me by but I have followed the upturn in their fortunes this year, if only by casting a cursory glance at the final scores. I had also read a lot about the exploits of quarterback, Alex Smith, which reminded me of the only 49ers player from the past I could honestly claim I could remember – Joe Montana. So as they had reached the playoffs and were live on TV last night at a manageable hour (9.30pm) – even if it meant missing The Football League Show on BBC – I decided to tune in to the final two quarters as they were leading 17-14 against the New Orleans Saints at the time. Having led 14-0 earlier in the game but the prospects for the remainder of the game did not appear promising to one unsuspecting football virgin. However, the sight of a scarlet hued Candlestick Park convinced me to stay the course. I can’t claim to have followed everything of what was going on, though touchdowns and field goals were at least comprehensible. And I can appreciate a long, accurate pass and even a mighty hit (I have always enjoyed these on the ice rink). Anyway, the third quarter passed without much incident, other than that San Francisco extended its lead to 20-14. The margin was still 6 points (23-17) as those final 3 portentous minutes started. It appeared to me that the home side was defending with increasing desperation and, with a history of supporting sports teams who so often ripped defeat from the jaws of victory, I felt staying up until nearly 1.30am would prove ultimately futile. And when the Saints went 24-23 ahead, it looked all over. But then Alex Smith, who had hardly had a bad game beforehand, ran in a 28 yard touchdown (I believe that’s the correct expression). So we’d (notice that?) won it 29-24 hadn’t we? Now, hold on a cotton picking minute (who was it used to say that, Deputy Dawg I think) – back come the Saints with a touchdown of their own to “win” it 32-29. Glorious failure then – a not uncommon feeling for this sports fan. With 14 seconds left, and my thumb poised on the off button on the remote control, Smith calls what seems to me to be a pointless timeout. Now this is where my ignorance of American sport kicks in. Of course I should have known that within 5 seconds he would plant the ball in the arms of the grateful, and soon to be sobbing uncontrollably, tight end, Vernon Davis, for the winning touchdown. 36-32! I was reminded in the midst of all this mayhem of the word “torture” that so eloquently described the San Francisco Giants march to the World Series 15 months before. I don’t think that I will still ever develop the affiliation I now have with the city’s baseball team – you might like to read my earlier post about how I fell in love with the San Francisco Giants (www.tonyquarrington.wordpress.com/2011/05/12/bitten-by-the-giants-baseball-bug) – but I have acquired sufficient interest to prompt me to learn more about the rules and tactics, purchase some 49ers merchandise, and be there in front of the TV for the next playoff game and, of course, the Super Bowl. OK, I’m probably getting a little ahead of myself now, but that’s what fans do don’t they? “King of the Crimps”, James “Shanghai” Kelly was not, as you might have thought, a world renowned hairdresser or Vegas high roller but a notorious criminal in 19th century San Francisco. 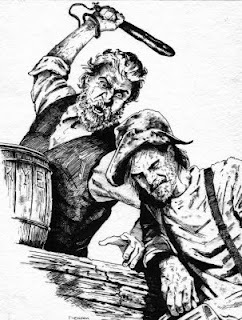 Crimping, or shanghaiing, was the practice of kidnapping men and forcing them to work on ships, and Kelly was the undisputed master of the art. He was, as described by Herbert Asbury in his excellent “The Barbary Coast – An Informal History of the San Francisco Underworld”, a “short, thick-set Irishman, with flaming red hair, a bristling red beard, and an irascible disposition”. Seduced, like many of his contemporaries, by the prospect of great wealth as a result of the 1848 Gold Rush in California, he fled to San Francisco where he immediately established a three-storey sailors’ boardinghouse at 33 Pacific Street, between Drum and Davis Streets, in the heart of the area known as the Barbary Coast. However, this was essentially a “front” for his unscrupulous but lucrative business of supplying sea captains with men to fill boats rendered increasingly empty by the desertion inland of prospective crew members to seek their fortune. Kelly satisfied the ship captains’ need by arranging for runners to row out to arriving ships and offer free drink and other inducements to frequent his boardinghouse and saloons. Once there, the unsuspecting sailors would be drugged with the “Miss Piggott Special”, his own cocktail of schnapps and beer spiked with opium, laudanum or chloral hydrate. The “Shanghai smoke”, a cigar heavily laced with opium, would follow, and that lethal combination failed to render them unconscious then they would be hit on the head” As one historian put it: “the tools of his trade were knock-out drops and a blackjack”. Once divested of their belongings – including their clothes – they were wrapped in a blanket, lowered through one of three trapdoors in the front of the bar and rowed out to a waiting vessel. The captain paid the crimp the agreed fee, hauled anchor, and set sail. When the sailors regained consciousness, they were well out to sea – heading to such faraway destinations as Shanghai. His pre-eminence in the crimping game was most dramatically illustrated in what has become known as his “birthday party” escapade. With his boardinghouse uncharacterstically short of guests, he was commissioned by one desperate sea captain to find 100 sailors urgently. The ever-resourceful Kelly quickly came up with a plan. Chartering a decrepit old paddlewheel steamer, the Goliah, he put the word out on the streets that it was his birthday and everyone was invited aboard to celebrate with free food and drink. Ninety men showed up and the Goliah put out to sea “amid great merriment of drinking, eating, and song”. As it left dock, Kelly proposed a toast: “to all my faithful friends, you’ve made me what I am today (heh-heh). Now down the hatch”. As soon as all the drugged guests had passed out, Kelly ferried them to the infamous New York based sailing ship, the Reefer, and two other vessels anchored off the Heads, just outside the Golden Gate. The still unconscious “sailors” were handed over to their new captains, who sailed away. Mindful that questions were sure to be asked when he returned with an empty Goliah, Kelly sailed down the California coast to ponder his next move – and struck lucky. Encountering the Yankee Blade off Point Concepcion, west of Santa Barbara, that had run aground and was taking on water, he saved its whole crew and sailed them up to the Market Street Wharf where, unaware of the true story, the citizens of San Francisco proclaimed him a hero. Some chroniclers of the Barbary Coast have shed doubt over the accuracy of this story but, nonetheless, it lives on in San Francisco legend. In fact, it was featured in an episode of the long-running TV show, Death Valley Days, narrated by Robert Taylor, in 1967. Kelly’s place in the city’s mythology was reinforced in 1985 by the opening of an old-time saloon named after him at Polk between Pacific and Broadway on Nob Hill. His crimping days were over when he himself was shanghaied and ended up jumping ship in Peru, although the message that got back to his adopted city was that he had been shot by one of his former runners. I am indebted to Gail MacGowan’s article on Kelly on www.sfcityguides.org which, in turn, is based upon works by Charles F. Adams, Herbert Asbury, Samuel Dickson and Bill Pickelhaupt.